“Cancer remains one of the biggest health threats of the 21st century, with a person diagnosed every two minutes in the UK. Survival rates have doubled over the last 40 years but with this, treatments such as chemotherapy can be gruelling with distressing side effects – such as possible hair loss. 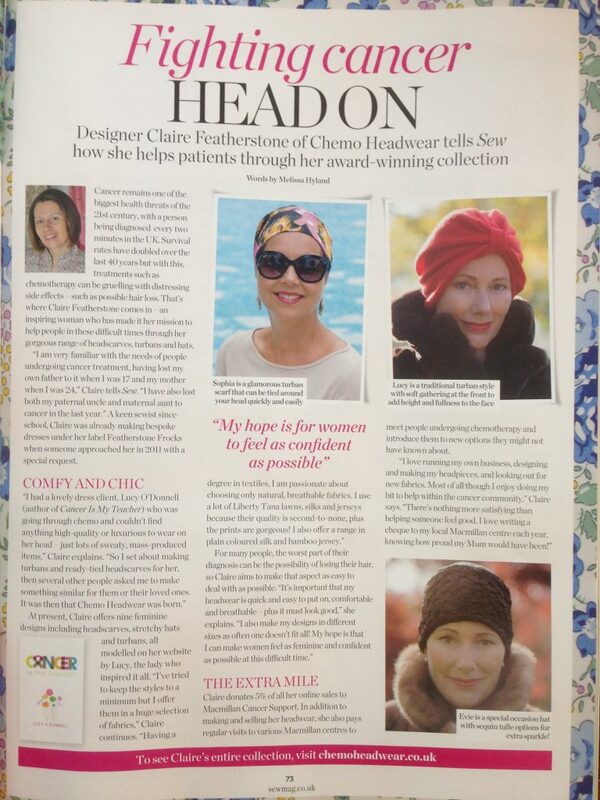 That’s where Claire Featherstone comes in – an inspiring woman who has made it her mission to help people in these difficult times through her gorgeous range of headscarves, turbans and hats. “I am very familiar with the needs of people undergoing cancer treatment, having lost both my own father to it when I was 17 and my mother when I was 24”, Claire tells Sew. “I have also lost both my paternal uncle and maternal aunt to cancer in the last year.” A keen sewist since school, Claire was already making bespoke dresses under her label Featherstone Frocks when someone approached her in 2011 with a special request. Claire donates 5% of all her online sales to Macmillan Cancer Support. In addition to making and selling her headwear, she also pays regular visits to various Macmillan centres to meet people undergoing chemotherapy and introduce them to new options they might not have known about. “I love running my own business, designing and making my headpieces, and looking out for new fabrics. Most of all though I enjoy doing my bit to help within the cancer community,” Claire says. “There’s nothing more satisfying then helping someone feel good. I love writing a cheque to my local Macmillan centre every year, knowing how proud my Mum would have been!”.